Record junkies, fans and ravenous collectors, take note: used record stores are your best friends, especially if the vinyl on hand is extremely affordable. Sometimes these places make it difficult to not walk out of there without spending fist-fulls of cash, or spending your entire day sifting through record after record. However, chances are the search is entirely worth it if you find something worth looking for. Just this week after hitting up one of my local Half Price Books I found this gem of a Richie Havens record, “Electric Havens,” which I have never seen before, nor new existed. Oddly enough, there were three copies and I picked the cleanest one the store had. It’s a curious little record, one that doesn’t seem to have much info about, except for a blurb here and there on the net. 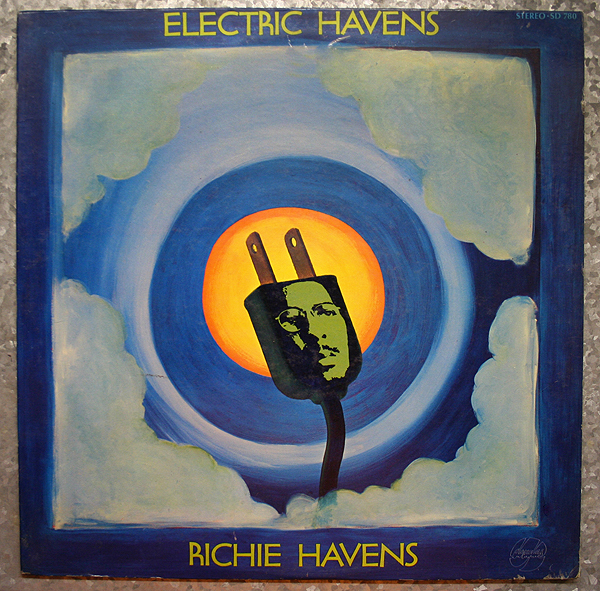 “Electric Havens” technically is Richie Havens’ second album, though it mostly consists of his early demos with a full electric band overdubbed. Released on the Douglas International record label, this LP saw release prior to Havens signing with Bob Dylan’s manager, Albert Grossman, and landing on Verve Records. 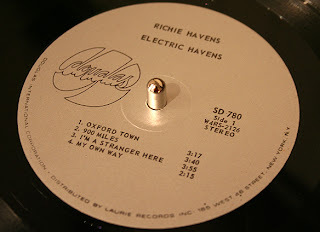 Probably the reason why there isn’t much info on “Electric Havens” is that the album supposedly wasn’t to see light of day, as Havens had the record pulled from the shelves shortly after, probably due to the treatment of the overdubs on his original demos. However, the record actually is quite interesting and works well on the level of being something that sounds like it was recorded live in the studio in one or two takes. The timing of the session band sounds slightly off in some places, like his cover of Dylan’s “Boots of Spanish Leather”, but there still resides a charm in the electric version that would be lost with the acoustic demo alone. 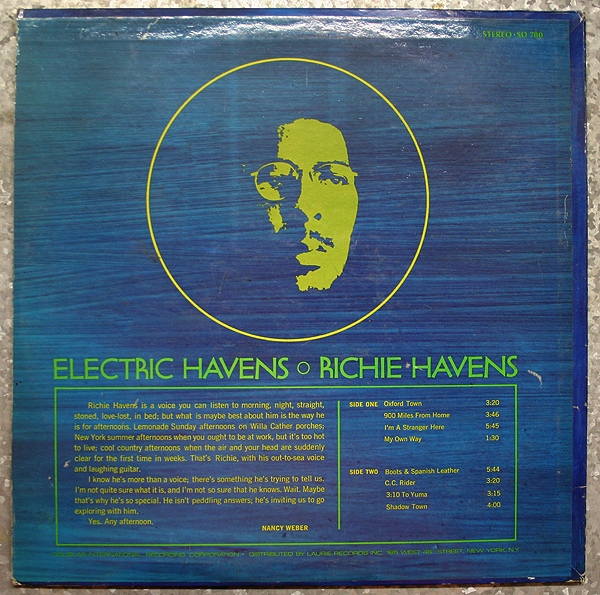 Havens, even in these early first recordings, has an austere vocal presence that earned him popularity and fame at Woodstock, and has served him well throughout his long career. Primarily, these recordings serve as a document of the traditional music Havens might have been performing in the club scene in early-mid 1960s. Another Dylan cover appears here, “Oxford Town”, which has a dark bluesy feel to Dylan’s quirky and upbeat original. Of course, Havens would go onto record a number of Dylan’s songs throughout the years and constantly and consistently make them ‘his own.’ Several of the songs presented here deal with the subject of a lonesome traveler, like “900 Miles”, “I’m A Stranger Here” and “3:10 To Yuma” which fits in well with the earthy blues and folk sound provided by the anonymous backing band. It’s a real shame more of the world doesn’t have easy access to these recordings. In fact, the album never saw release on CD, assuming Havens still wanted to keep it locked away in his vaults. Thankfully, few vinyl copies have escaped for our listening enjoyment. I’m reminded of the two demo albums by Tom Waits that saw release after he came onto the scene; another instance where those recordings were not intended for commercial release. I’m glad they were, however, as they are some wonderful, heart-felt and honest recordings, like I find “Electric Havens” to be. My only complaints about this LP is the lack of info about the contributing musicians, the some-what boring cover art and that the record is entirely too short. But hey, what are you gonna do? We’re lucky to have what we have. This entry was posted on Thursday, August 25th, 2011 at 11:05 pm	and is filed under Music. You can follow any responses to this entry through the RSS 2.0 feed. You can skip to the end and leave a response. Pinging is currently not allowed. « HBO CONFIRMS DECEMBER DEBUT DATES FOR NEW SERIES ‘ANGRY BOYS’ AND RETURNING SERIES ‘THE LIFE AND TIMES OF TIM’!!! Looks like I'm going nowhere... I'm gonna finish cleaning those 'droids. [after Luke leaves] Owen, he can't stay here forever, most of his friends have gone. It means so much to him. Well, I'll make it up to him next year, I promise. Luke's just not a farmer, Owen. He has too much of his father in him.